The American Embassy in Rome, home to Dante Mortet and his sculpture The Hateful Hand’s, the presence of the highest offices of the American Embassy and important members of the Italian-American community, accompanied by live music by Ennio Morricone performed by Master Tom Sinatra. Hateful’s Hand’s, is a unique sculpture. A three-dimensional sculpture, bronze, the hands of Hollywood stars. A tribute, Dante Mortet, to the manual, in the world of movie. The sculptures, made from original molds, and interpreted by the artist, telling the story of the film, and the character of their protagonists. for the first time, in Hollywood, the city, with the handprints in cement ., this sculpture, represents a more realistic version, conveys the emotions of the hand’s to the actors, the film industry. 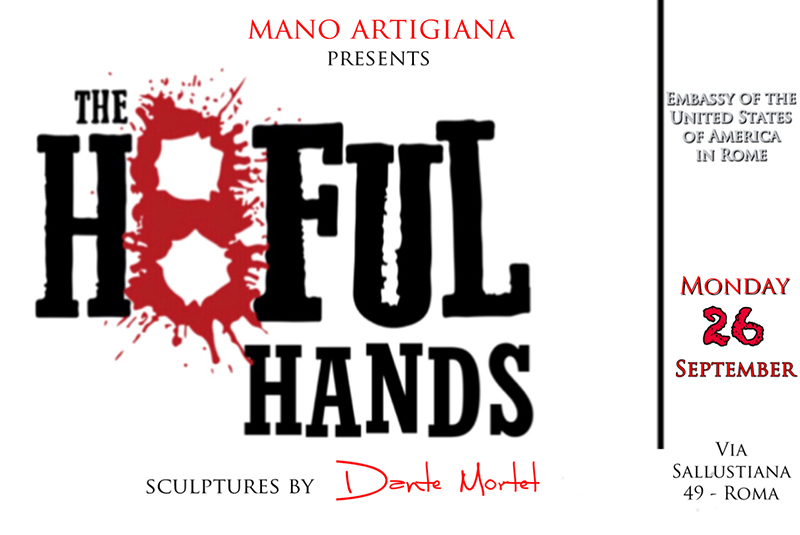 With this sculpture, once again, their hands, and their knowledge, are the protagonists of the concept, that the project, MANO ARTIGIANA offers, that is, the proper development of our economy and society, with the correct use of the hand. The sculpture, which was carried out between Telluraide, Los Angeles and Rome, with the collaboration, Quentin Tarantino, Jennifer Jason Leigh, Samuel L. Jackson, Michel Madsen, Walton Goggins, Kurt Russell, Damian Bichir, Bruce Dern, Tim Roth and Ennio Morricone, Oscar Award for the music of Hateful Eight.